You’ve finished your drills, learned the basic strokes, and you’re ready to DO something with your new skills! 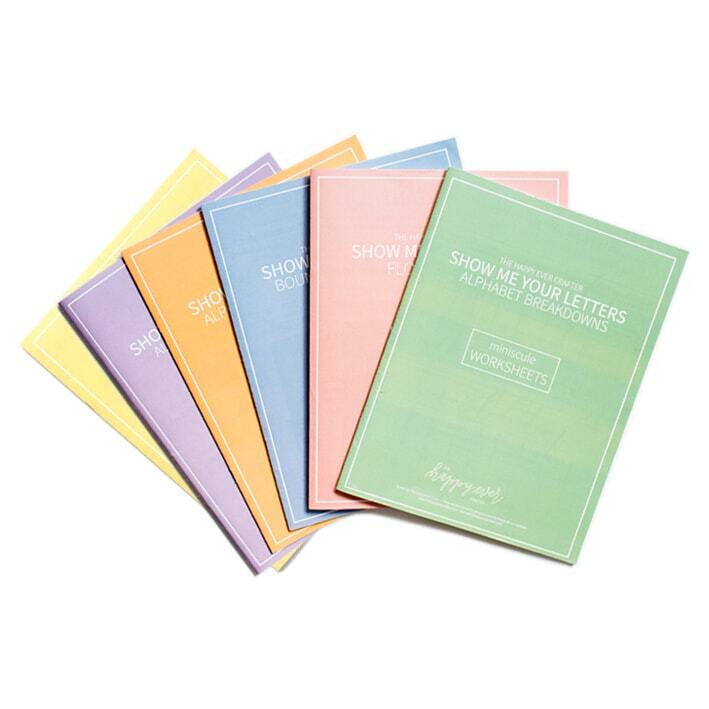 The All Workbooks Bundle is a limited-time bundle of all of the workbooks in the Show Me Your Drills, Show Me Your Letters, Show Me Your Words, and Show Me Your Style series. These Workbooks & Online Trainings will walk you through, step-by-step, how to write the entire alphabet in lowercase and uppercase letters, how to connect your letters to form words, and, finally, how to put a spin on your work to create your own unique style. By the end of the semester, you’ll be able to create beautiful full-page calligraphy pieces effortlessly. This is a DIGITAL product including downloadable PDF materials and virtual trainings—no shipping is required. Choose the pen size that you’ll be using so that you purchase the correct workbook! Need help with pens? Scroll down to the FAQ below. I’ve helped over 50,000 students in my basics course, Show Me Your Drills, that teaches the basic strokes behind modern calligraphy. This workbook builds upon those skills to confidently start writing letters, words, and, ultimately, creating your own unique calligraphy style! Access to Show Me Your Drills, my basic calligraphy strokes program, where you’ll find suggestions on supplies, tips on correctly using your pens, advice for lefties, and more! Traceable sections and freehand sections, so you can learn without fear! BONUS! Over 5 hours of additional video demonstrations and replays throughout the semester! Which version of the workbook do I need? There are three formats of this workbook available— one for small pens, one for big pens, and one for iPads. The only difference is the size of the traceable sections— slightly smaller for pens with small tips, and slightly larger for pens with big tips. You’ll want to purchase the workbook that fits the pen size you’ll be using. Which size pen should I use? The choice is entirely yours— many people use both! How long do I have access to this for? INDEFINITELY! You will never lose access to any of your purchases, or the walkthrough videos that come with them. You don’t have to work through it at the same pace that I do- you can come back to it ANYTIME. For more information on what is included in each workbook, please visit the main workbooks page to read their individual descriptions.